Imagine a thief who is able steal without sneaking, in broad daylight. “I need it,” he says, and walks off with property that was earned by another, belongs to another. In America, you couldn’t get away with that – there would be consequences, or at least a halt to the theft, you would think. But consider the very real case of Russ and Pat Caswell and their family. Over six decades they have built a small business that proudly serves as a motel in Tewksbury. 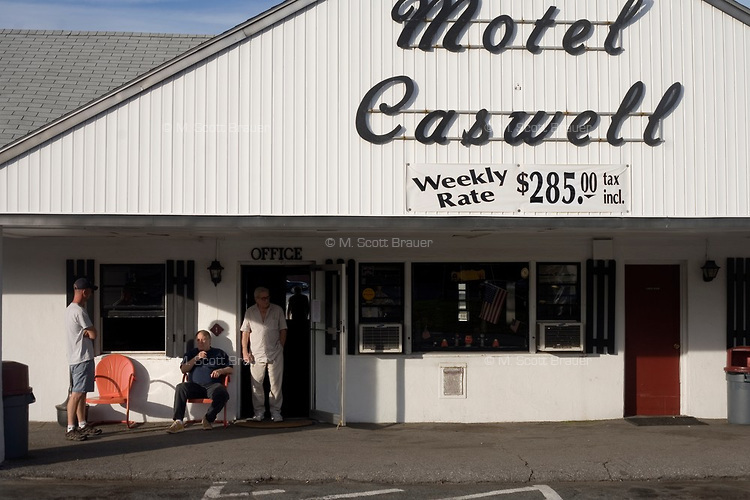 Slowly and carefully, through sweat and smarts, the Caswell’s have maintained a motel that has succeeded through the years. They have now hosted some 125,000 rooms over just the past 20 years. No thief should get away with stealing from them, certainly not stealing their whole motel. Oh but it’s happening, in broad daylight, by the very people who are tasked with protecting life and property: the Tewksbury Police, the US Justice Department and the Drug Enforcement Agency. It is a shameful moment for departments with long proud histories. Surely it must be a mistake, you may think. What reason could they possibly give? The law enforcement officers are literally claiming that because some of their residents are criminals, the Caswell’s have forfeited the right to their property they earned and maintained over generations. These customers are individuals. And as any adult is aware, there is a small percent of people who aren’t law-abiding. In this case a meager 0.05%, of the Caswell’s guests who were arrested over two decades. Throughout this time, the Caswell’s have been not only themselves law-abiding, but quite eager, as you’d imagine, to work with local police as they investigate any criminals or possible crimes committed on their premises. Apparently this is not enough for local government, perhaps especially since the Caswell’s have managed to pay off the mortgage, and now own it in full. They’ve chosen to target a mom-and-pop operation, instead of a big company with lawyers on call. The fact that criminals during some small percentage of time resided on the premises is apparently a great excuse to take the property, by force. It’s as if the motel property itself has been declared guilty. Sure Russ Caswell and others have made numerous 911 calls over the years. But the government is actually using that proper use of government services as evidence against the Caswell’s. One supposes they should have never called the officials, had they known they were forfeiting their property rights in doing so. The property, near Main Street, is 4.5 acres, and worth $1million. The government is actually claiming it’s trying to stop criminals by seizing this property of law-abiding Americans. The building and land could be used by the local government, or sold, with proceeds going mainly to the police department. It makes no sense; they claim to be fighting crime while punishing the victims of crime. Back in 1986, a profit motive was added to America’s previously limited civil forfeiture laws. The chance for local police departments to bypass their budgets by this means became huge. Successfully seize and it’s yours, with a small portion of the worth going to the federal government. As you may guess, since 1986 civil forfeiture use has blossomed, from $93 million to a stunning $1.6 billion. The DEA now has agents who specialize in identifying properties they can seize, giving the appearance of a department focus on acquiring properties of value with ease, over a desire to protect and serve. The Tewksbury Police and the US Justice Department perform a multitude of essential and even heroic acts. In this story however, the heroes are the upstanding Mr. Caswell and Mrs. Caswell, and the government is playing the role of a miscreant. The Caswell’s, and a group called Institute for Justice, who are working for free on their behalf, deserve our support. When Russ and Pat head to federal court in Boston on November 5 to defend themselves and the business they built to fund retirement, they also defend the rights each of us possess to the property we have earned. Please support Mr. Caswell, Mrs. Caswell, and the Institute for Justice, as they try to bring this shameful story to a righteous end. I live nearby for almost 40 years now and never thought much of the Caswells’ business. A rate of trouble customers of .05 % is certainly the average in any business and no grounds for seizure of the Caswells’ lifetime achievement and well earned property. The Caswells are not on trial here as they have impeccably called on the police for protection from having their property infested by criminals. The defendant is their property that they now own free and clear after decades of hard work and frugal determined efforts. They are being threatened to be punished for the deeds of others, the criminals that used their motel as a cover to hide their crimes. If this case stands, nobody’s property in this town, in this Commonwealth, or in this Nation is free from the threat of arbitrary seizure. Our overreaching Government has been transforming itself from our servant instituted among men to secure our rights for decades. It has become our ruler and it is only a matter of time, when the last remnants of unalienable rights to our own life, liberty and the pursuit of happiness get extinguished by precisely such train of outrageous transgressions. Just because you feel it should be shutdown doesn’t mean the government has the right to take away a business that has been family owned for over sixty years. They have tried to work with police and the police keep them in the dark. The weekly rates help those in this economy that may not be able to afford that 1st and last month’s rent to secure an apartment. Have you seen all the foreclosures in the area? Have you heard about the unemployment numbers? The Caswell’s have every right to keep their property they’ve earned it, not the government! I want to know how we can support them on November 5th….. I also grew up in Tewksbury. What I remember the most about the Caswell is there was a murder on the property. Now I am reading that they called the police many, many times in the 20 years they have owned the Caswell. It is time that perhaps the hotel be torn down and a different business is put there. The sign that posts their weekly rate, to me, seems like they rent to full time people. It isn’t just a vacation place for people to come and leave. I don’t think the town of Tewksbury will miss the Caswell at all. I know I would have never stayed in that hotel. It is the Caswells’ right to dispose of their property in the way they see fit and nobody besides the Caswells possesses this right! You may wish to approach them and ask them, if they would consider selling the property to you at the price you can afford. After that legal transaction has taken place, you are free to do whatever you wish to do with it. That is the meaning of property rights. Are Police Asset Forfeiture Squads Out of Control? Bars, restaurant and rental property owners Increasingly fear police; strongly believe that police can make it a point—to shut down or seize any bar, restaurant, motel or residential rental property by arresting a customer or tenant unbeknownst to the owner—possessing or distributing drugs; or undercover police / informants can steer drug sales or buys onto private property to forfeit it. Some owners of bars, restaurants and rental property become police informants, report on their customers—in the erroneous belief police won’t target their business or property. There are more than 350 laws and violations that can subject property to government asset forfeiture. Government civil asset forfeiture requires only a civil preponderance of evidence for police to forfeit property, little more than hearsay. No one need be charged with a crime. Corrupt Police can create the hearsay. If police civil forfeiture abuse is not brought under control it is foreseeable many Americans will be afraid to own real and personal property that comes in contact with the public. It is understandable that more business and rental property owners fear police. Almost every week, national news reports police, including high-ranking police and sheriffs being arrested for selling drugs, robbing, extorting or protecting drug dealers, planting evidence; filing false reports to send innocent persons to prison. Next: Police Drones—Recording Conversations In Your Home & Business To Forfeit Property? Police are salivating at the prospect of having drones to spy on lawful citizens. Congress approved 30,000 drones in U.S. Skies. That amounts to 600 drones for every state. It is problematic local police will want to use drones to record without warrants, personal conversations inside Americans’ homes and businesses. Despite some U.S. cities and counties banning or restricting police using drones to invade citizens’ privacy, local police have a strong financial incentive to call in Federal Drones, (Civil Asset Forfeiture Sharing) that can result from drone surveillance). Should (no-warrant drone surveillance evidence) be allowed in courts—circumventing the Fourth Amendment, for example (drones’ recording conversations in private homes and businesses) expect federal and local police civil asset property forfeitures to escalate. Civil asset forfeiture requires only a preponderance of civil evidence for federal government to forfeit property, little more than hearsay: any conversation picked up by a drone inside a home or business, police can take out of context to initiate arrests; or civil asset forfeiture to confiscate a home/business and other assets. Local police now circumvent state laws that require someone be convicted before police can civilly forfeit their property—by turning their investigation over to a Federal Government Agency that can rebate to the referring local police department 80% of assets forfeited. Federal Government is not required to charge anyone with a crime to forfeit property. There are more than 350 laws and violations that can subject property to government asset forfeiture that have nothing to do with illegal drugs.